Warranty is only when you visit our practice for at least once a year check-up and follow our instructions in case of your dentition. We try to do our best we can to keep you happy all the time, but may happen that you’re not satisfied, please tell us. You can send an email about it, we’ll than invite you for a clarifying consultation and find a solution. If we can’t figure it out together, you may contact than the ANT. Pure Esthetics B.V. sends your bills after your consultation or treatment to our factoring company Fa-med B.V.
1. Fa-med declares the bill directly to your health insurance if they has a contract with Fa-med. 2. Fa-Med declares the bill with your health insurance. If there is anything what’s not covered by your insurance, you’ll receive a bill from Fa-Med. 3. If your health insurance has no contract with Fa-med, you must declare your bill yourself with your health insurance. 4. If you don’t want to receive your bill from Fa-med, you may pay by pin or cash at the reception after you had the treatment or the consultation. 5. If you have any questions about your bill, please contact Fa-med phone number 0900-0885. 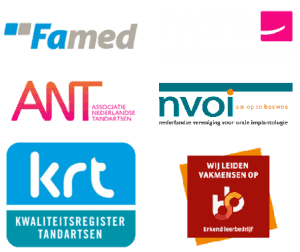 Monday till Fryday from 8:00 to 18:00 h. You can also visit the special patient website notavanfamed.nl. You’re responsible for the timely payment of your bill, as well as changing of your address, email or health insurance. If we receive a notification from Fa-med, that you didn’t make the payment of your bill, you may still be treated in the future, however you must pay the bill of the consultation or the treatment immediately after by the reception by pin or cash. You will be notified when you make the appointment. If you want to know if your treatment will be covered by your health insurance, you can always ask for an estamation of the cost from your dentist and check it by yourself with your health insurance. If an appointment is not cancelled on time (no later than 24 hours), we are entitled to charge you the fee. Changes such as relocation, changed family situation, change of your health insurance, deceased family member, illness, whether or not combined with medication and other important information, should be communicated with us via an email/letter, personally or by telephone. During a consultation you can get the advice for a treatment plan for your teeth, in case of larger treatments we also set up an estamation of the cost. We will explain to you as clear as possible what about treatment . This allows you to inform your health insurance of the compensation for this treatment. Before your treatment you have to return the estamation of the cost signed, this way you agreed with the treatment and the cost. We recognized by SBB as a learning company. This means that we have been tested for our expertise to support students in the field of dental assistant and oral hygienist in their education. Ons techniek werk (waaronder kronen, bruggen, facings en protheses) worden in een extern laboratorium gemaakt. Wij werken samen met Elysee Dental, Dentalform en Tandtechnisch laboratorium Busselaar.